Mindfulness is simply the practice of paying attention to one's life, moment by moment, without judgment. It is being awake to what is simply happening now. The opportunity is always present. Mindfulness based psychotherapy informs this process and practice of presence. Think of someone you know who has a loving presence, just being with them calms you down and allows you to sit up straighter inside yourself. Ram Dass described this as a person who "knows". They seem to get the Cosmic joke. They are here on the planet, but it's like they took the Red Pill in The Matrix. They play the game of life, but they are not fooled by it. They view the world through the eyes of Soul (Red Pill, Love), not Ego (Blue Pill, Illusion/Control). Mindfulness practice is one path towards this awakening. In service of this Red Pill pursuit for myself and my patients, I recently downloaded a mindfulness app informed from ACT therapy, a mindfulness based psychotherapy. ACT stands for Acceptance and Commitment Therapy. The App is called, "ACTcompanion". The app provides meditations and teaches one simple presence exercises, both formal and informal. The ACTometer is especially helpful in underscoring the main teaching goal in ACT: psychological FLEXIBILITY. In essence, mindfulness isn't abut becoming a good meditator. It is about living life fully, taking the mindful consciousness into one's daily life - this moment. For example, the ACTometer asks one to describe a difficult event, rate their experience of the event (how challenging, uncomfortable or distressing the event was for them) on a scale of 1-10. Then asks for a description of the emotions, thoughts experienced and sensations felt at the time of the event. The next question is: HOW PRESENT WERE YOU DURING THE EVENT? This means, did you get lost in the event, what happened, your feelings, the "story", the "shoulds", were you taken for a ride because of this event, text message, email, or interaction? Think of a recent distressing event... How soon were you able to come back? Did you obsess on this all day? for weeks? years? Or could you anchor yourself and watch everything happening inside you and outside like a movie? Could you stay present? Then one rates their level of OPENNESS to their thoughts, feelings on a scale of 1-10. Then one describes the actions taken in response to the event. The next question is: TO WHAT EXTENT DID YOUR BEHAVIOR REFLECT YOUR CORE VALUES, as they apply to this situation? Rate this on a scale of 1-10. This means, did I act in accordance with my values, or was I hijacked by the scene and my feelings/thoughts about it? Did I react from ego? In essence ACT and other mindfulness based psychotherapies teach us that presence is the practice no matter what. Presence is always the goal. Presence is our power. The feelings are just part of the ride, like a roller coaster or scary movie. All can and should allowed, accepted, experienced. You stay on the roller coaster ride, you don't jump off or try not to feel it. This just creates more problems. This is mindfulness, noticing and being present to what is. However, with mindfulness we learn that we can still choose a response in line with our values, regardless of the stimulus. The choice still comes from within. 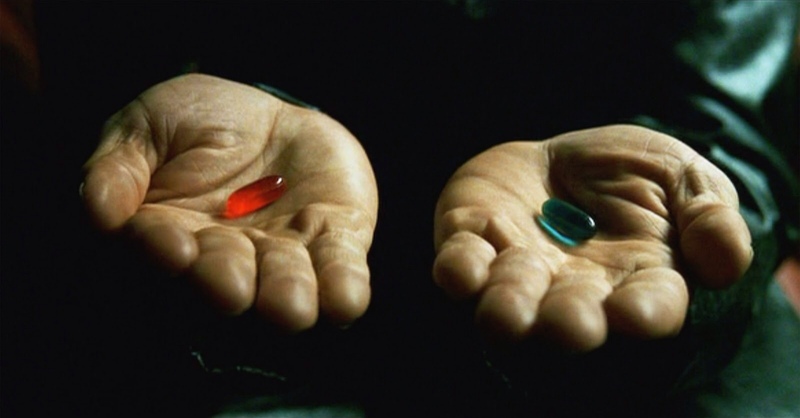 Do I take the blue pill and try to stay asleep, avoid, deny or fight with what is- Or do I take the Red Pill, witness, feel, live and wake up? This is psychological flexibility. As Pema Chodron says, "This very moment is the perfect teacher..."
This is presence, this is power.